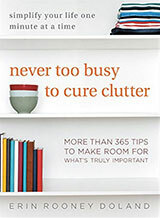 Hoarding is a topic that we at Unclutterer feel should be part of the uncluttering conversation. Hoarding is a serious medical condition, usually linked to obsessive compulsive disorder, which can take over someone’s life and living space. All three of the authors are very curious about the issue of hoarding and how it impacts the lives of New York City residents. This project will explore the hoarders, psychologists, social workers, and cleanup specialists for whom hoarding is a defining phenomenon. The final version of the site will be live by March 23, 2009. While readers of Unclutterer may be familiar with hoarding, it is a psychological ailment that still isn’t understood by much of the general public. It is encouraging to see these journalism students working to increase public awareness about the disorder’s damaging effects. Once again, hoarding is a disorder that should be treated by a licensed medical professional. I just discovered this site recently too — it’s fascinating to watch it evolve. It makes me tired, just to see the pictures. My heart hurts about the internal exhaustion that must have led these people to this place. When I look at these pictures of hoarding problems, it is always so horrifying. But what about “neat hoarding”? Is it any less deadly than these? You know, like people who keeps buying storage solution for stuff they never use. I can speak as a person with a hoarder in my family. My aunt Pam is a hoarder and has been for almost 20 years. There is a path through her house, just about 8 inches wide where people can navigate through the piles. She also has multiple cats who use the entire house as a litter box. She is very resistant to help when family members try to assist her. It has dramatically impacted her relationship to our family, the kids, nieces and nephews, etc. As a child we used to spend whole weekends at her house, I have great memories of that. Now no one from the family dares step foot in the house. This is a very serious illness and I wish that our family would have been able to take it seriously years ago. If you know someone who is showing signs of hoarding, address it as early as you possibly can. I really cant understand hoarding. I have relatives letting cars rot away in their back yard that they could sell. They let them rot, they will not sell, my father in law could make thousands if he let a junk yard come in and harvest the 30 cars on the property. They have basements full of utter junk, they buy a new couch, the old one is stored in the shed. I just checked out Hoardhouse and Catherine’s place made me cry. I think it was the “Stop and Smell the Flowers” sign, and her crumpled up baby pictures. I sure hope we can figure out ways to help these people overcome their hoarding. My MIL was well on her way to similar house when we had to move her and my FIL into a retirement community. She had paths through many of the rooms in the house. Trying to empty the crawl space and garage were very difficult because she didn’t want to part with ANYTHING and cried when anything went into the dumpster. It is an agonizing experience for anyone. The only reason that her new home isn’t completely cluttered up is because she can no longer drive. I can guarantee it would be like her old home if she could. My mother was a hoarder. Newspapers, plastic containers, ten thousand Harlequin novels, old stained clothes from years past. Between the cigarettes and dust mites, I grew up with bad bronchial asthma which has progressively grown less onerous as I learn more decluttering and allergy-management skills. The estate cleanup was a major undertaking and a one-bedroom apartment filled up one dumpster and a good portion of a second. It is the media that is helping the rest of the world realize that there is a serious mental health problem around the globe??? Seems like there are more and more stories like this every other month or so. These situations are truly distressing to me. My best friend is heading down that path of hoarding-dom and it scares me that there is nothing I can do as a friend, except sit by and watch. My husband’s family is the dictionary definition of hoarders. I hate going over there and I refuse to eat there. It’s disgusting. This issue has fascinated me for years. When I did a serious decluttering of my apartment several years ago, I was stunned at the amount of worthless crap I had kept around. Bag after bag of stuff! I think I made upwards of 10 trips to the local Goodwill store in the span of two months and that doesn’t even cover all of the stuff I just tossed in the dumpster. I don’t remember what my “breaking point” was that finally snapped me out of my funk and got me cleaning. What I do know is when I did finally release all of that clutter, I felt like a totally different person–emotionally, physically, mentally. I have peace now when before my life was only CHAOTIC. And when I say life, I mean everything–work, home, thoughts, emotions, habits, etc. So I’m always curious to watch and read articles about this issue to find out the deeper causes of this illness. Thanks for the links. I will definitely keep up with the HoardHouse Project. ANOTHER RESOURCE! See last sentence for links. Hoarding is a form of Chronic Disorganization. There is a scale that one can be measured against to determine their level of crisis. Many times the hoarder needs the “stuff” to feel comfortable and safe, or even how to navigate within their space. It has nothing to do with the monetary value. It is horrible for them to go through having to dumpster it, however this is common as the homes often become fire hazards. One can also find help through the National Association of Professional Organizers at napo.net. 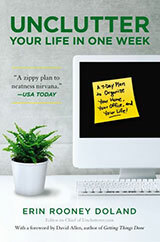 @gayle — There is a very large distinction between chronic disorganization and Hoarding. Hoarding is a diagnosable psychological disorder in the DSM-IV that should only be treated by a licensed medical practitioner. A professional organizer can help someone with chronic disorganization, but is not licensed to treat a hoarder. It is against the law for a professional organizer to claim to be able to treat Hoarding. At Unclutterer, we strive to make this distinction very clear. If someone is a Hoarder, he or she should NOT seek the services of this website or a professional organizer — a Hoarder should immediately contact a licensed medical provider and ONLY a licensed provider. NSGCD does provide certified training for the Professional Organizing industry. Professional Organizers are not therapists, and a NAPO PO will never claim to be one without having the proper credentials. However, there are many POs certified to work with CD patients, just as there are many certified to work with ADD and other issues. The NSGCD offers a five level certificate and certification program to any of our members wishing to advance their skills in this vastly growing area of professional organizing. I also would refer you to NAPOs website for more information on the Certified Professional Organizer testing and certification program (not CD-specific, but another type of industry certification). Often, a PO will work with a therapist to assist a client. While a therapist is qualified to handle the mental health aspect of CD, an NSGCD-certified PO is qualified to assist the client with the hands-on in-the-home sorting/purging and support that these clients need. CLARIFICATION: There should be a hard return in paragraph 2, after the word “organizing”. The statements after that are not on the NSGCD website, those are my comments. I apologize for any confusion that may cause. @gayle — I am very familiar with NAPO and the NSGCD and both of their certification programs. Neither NAPO nor NSGCD are medical organizations. No one who becomes a member of either of these organizations is required to go to medical school or to be a licensed medical practitioner. Neither organization claims that their members can TREAT Hoarding. In fact, it is against the law for these organizations and their members to make such claims. A professional organizer can work WITH a licensed medical practitioner to help fix the situation in a home, but these organizers are not TREATING Hoarding. A Hoarder should never contact NAPO or NSGCD to be treated for his or her medical condition. A Hoarder should contact a licensed medical facility to receive treatment for the disorder. To suggest that a Hoarder should follow a different plan of action is 100 percent in violation of United States federal law. Additionally, chronic disorganization and Hoarding are NOT the same thing. Chronic disorganization is not a diagnosable disorder in the DSM-IV. Hoarding is, however, found in the section on Obsessive Compulsive Disorder. Thank you for sharing the information about and link to Hoardhouse. As a member of both NAPO and NSGCD and an organizer that works with hoarders, I can attest to the fact that I do not treat hoarders, but I do provide a service that addresses the physical realities of the disorder. Chronic Disorganization or CD is not in the DSM (of any number), but it is a way for us to describe the issues that individuals who suffer from it have to deal with. The NSGCD created the Clutter Hoarding Scale in an effort to provide a common language for describing the range of what can be seen in environments created by the chronically disorganized. Also, there are organizers working collaboratively with therapists to help hoarders who are motivated (and/or being compelled) to change. As David Tolin (co-author of Buried in Treasures) said at the 2007 NSGCD Conference in New Jersey, we are the tip of the iceberg in understanding the disorder. He also pointed out that Hoarding may require its own section in a future DSM. It might help the conversation to note that professional organizers can work alongside clients in behavior modification and the physical work of organizing the hoarding mess. The horder should be seeking proper medical help, and some organizers will not work with a horder until they are under medical care. I have worked with horders not under medical care or at least they said they were under medical care but would not involve me whatsoever in their private conversations, and that’s fine. My organizing firm is following the direction of the client and we are doing what they asked us to do. Thank you for this post, and for the hoardhouse link. I am working hard to overcome compulsive hoarding and I appreciate any sensitive advice or comments, like the ones in this post. I, too, have a close relative who is a hoarder. I know she is ill and has reasons to be that way. However, I don’t know how to help her. She resists all suggestions and offers of help. Is there anything else I can do besides stand by and let it happen? I fear that her landlord would evict her if he ever saw her apartment. To suggest that a Hoarder should follow a different plan of action is 100 percent in violation of United States federal law. Which law is this, Erin? Is it specifically about hoarding? Or is it more about mental illness? Or is it about health in general? Or practicing medicine without a license? I’m not doubting that there is a federal law that has a direct impact on this situation, by the way, and that you in your role at unclutterer.com would need to be very aware of it and respect it scrupulously, but I’d like to know more. @Denise — Fantastic example with the diabetic and a personal trainer. The laws I’ve been referring to are misrepresenting oneself as a licensed medical professional capable of treating medical disorders. Every state in the United States has these laws on the books, so the actual numbers of the laws vary from state to state. For Unclutterer or any professional organizer to say that we treat hoarding is a violation of this law and can be punished in the court system. I used to have a compulsive shopping addiction which then turned into a hoarding problem, but the i got control of the shopping problem and that stopped the hoarding after about 6 yrs. You might be interested in a new information website on compulsive hoarding – http://www.compulsive-hoarding.org It is a comprehensive resource of up-to-date information about compulsive hoarding, its diagnosis, research, treatment and the available support. You’ll also find FAQs, tests and the latest views on this disabling illness. As declutterers in the UK, Beverly Wade and Chrystine Bennett of Cluttergone have worked with over 200 individual declutter clients, some of whom are hoarders. They have developed the website for sufferers of compulsive hoarding, their friends, families and anyone with an interest in the subject.